I have a bone to pick with labelling laws when it comes to gluten free foods. I mentioned this in my newsletter I sent out a couple days ago, but let me back up a minute and explain. A couple of weeks ago Mike and I went to a local wholesaler recommended to us as a great place to get gluten free flours and ingredients – crunchy granola hippie things you can’t necessarily find in your local supermarket – nutritional yeast, coconut sugar, organics, stuff like that. It probably says a lot about me as a person that the idea of being able to buy bulk bags of almond flour and coconut sugar exciting, but there you go. After checking the labels on the bag and seeing the only potential allergen listed was nuts I started throwing things in the cart and imagining all the grain free/ refined sugar free baking I was about to do. Real exciting stuff, obviously. A couple of minutes in I noticed the giant bags of wheat bran sitting right next to the coconut sugar in the exact same packaging. I pointed it out to Mike who then went to ask a staff member about the packaging procedures for gluten/non gluten free foods. He was told that despite the packaging only declaring nuts as a potential allergen there was also wheat cross-contamination that they’d failed to list. According to their staff the ‘may contain’ warnings on labelling are a guideline rather than a law which means that there’s no legal requirement for manufacturers to declare potential cross contamination; only a recommendation that they do so. Cross contamination may not sound like a big deal if a food or ingredient is inherently gluten free but the fact is, food needs to contain less that 20 parts per million in order to be safe for most Coeliac’s. In layman’s terms, crumbs are enough to cause an autoimmune reaction in people with serious Coeliac Disease. I don’t bring this up to scare anyone. I hate those kinds of marketing ploys. Haaaaaaate them. A couple of weeks ago someone set me an email asking to add a link on my blog to a post on their website explaining the health benefits of ginger or something like that. I was on her site for all of 5 seconds before a giant popup filled my screen promising to tell me what 5 foods are going to give my children cancer or something else equally ominous and threatening. All I needed to do was give them my email and then I’d get to learn the supposed life saving news. Absolutely not. I only share this story to remind you to 1) always check the labels and 2) ask questions. Mike missed out on about 10 years of his life because of undiagnosed Coeliac Disease and one of his thumbs is permanently fused in place because of the arthritis he developed as a result of it. I hate the thought anyone else going through the same thing. I also hate the thought of people frustrated that they still symptoms of Coeliac Disease even though they’re eating what they think is a gluten free diet. On the bright side, I don’t there are too many cases of this kind of thing happening. More and more people are learning about the seriousness of Coeliac Disease and with awareness comes more protection. Unfortunately as we learned, it does happen and even once is once too often. Last week Mike had a meeting with a local politician (the former deputy Prime Minister!) about this issue and how to fix it. His goal is to make it law that manufacturers are obligated to list potential allergens rather than it being a suggestion. 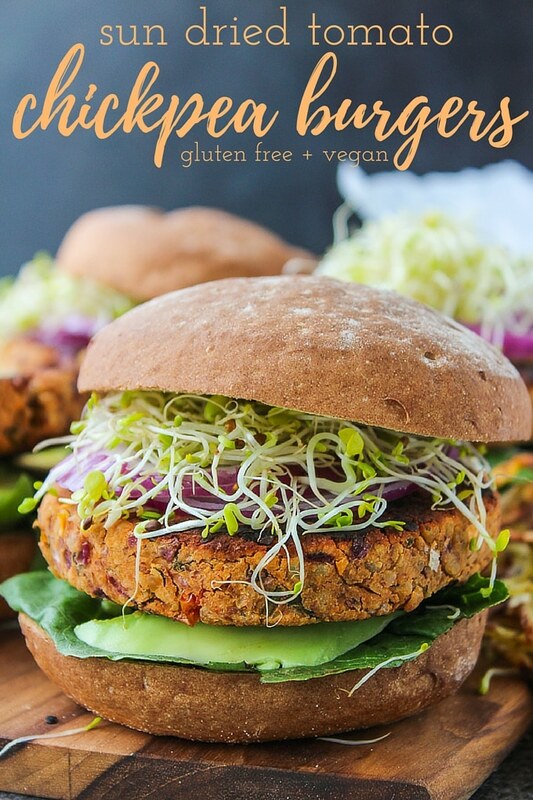 If you ever need to prove to someone that plant based foods are the stuff (I’d say the real word, but my mom reads this blog) then might I recommend making them these burgers. I can’t get over how much I love these burgers and how much I want to eat them all! Even though I have a lot of meat containing recipes on this blog, I personally eat a vegetarian diet 80% of the time. That’s pretty easy considering the fact that I mostly live off of cookies, but whatever. I just happen to be married to a meat loving man who enjoys chicken more than any human being has a right to. That being said I make it my mission to feed him as many plant based meals as I possibly can. It’s not that hard to do, but I need to get creative every now and then because there are only so many days in a row that I can get him to eat a standard chickpea curry without protest. Which brings me to these chickpea burgers. I had a jar of sun dried tomatoes sitting in the fridge begging to be used. It reminded me of the most amazing sun dried tomato quinoa burger that I ordered from a pub of all places sometime last year. I did a quick google search of the menu hoping to see whatever went into it, but realized that they must have taken it off the menu because it was no where to be found. After a bit of experimenting and substituting (chickpeas for quinoa) I ended up with these burgers and now they are my new favorite thing. After these cookies. Make sure that you dry the chickpeas as much as you can before processing them. Too much moisture will result in a sticky mess making it difficult to shape patties. I ground the almonds myself using my blender. I left in a few larger bits of almond because I love the texture but that’s totally up to you. Other than that it’s a pretty straight forward recipe! I hope you enjoy these burgers as much as I do! Don’t forget to #asaucykitchen on instagram if you try these burgers. I love seeing what you make! You can also post your pictures to my facebook page! In a food processor blend the chickpeas, red onion, garlic, sun dried tomatoes, basil leaves and blend until smooth. You can do this in a blender if you don't own a food processor, but you'll need to add ingredients one at a time and stop to scrape down the sides more frequently. Add the ground almonds, salt, and pepper and continue to blend until everything is evenly incorporated. Transfer to a bowl, cover, and refrigerate for at least 20 minutes. This will help firm up the mixture so they are easier to mold into patties in the next step. Mould the chickpea mixture into 5 patties. If your mixture is too sticky you can add a little extra almond flour, just try not to add too much because you don't want the burgers to be crumbly. Place the patties onto a lined/greased baking tray. Brush each side with the olive oil and then bake for 30-35 minutes or until golden at 400°F/205°C. Yay! So glad you guys enjoyed them! Thanks Jorden! Hi there! I was wondering what I could use in substitution for the almonds? Would oat flour work? Or would you highly suggest almonds? Also, this recipe looks delicious! Hi Alicia! I haven’t tried it yet with oat flour but I do think that would be a good substitute! These were good! I did end up grinding almonds to make this but will try again with oat flour another time! Tasted like a vegan pizza burger at times! Awesome! Really glad you enjoyed it! Could you use almond flour instead of ground almonds? Strange question. I am thinking of bringing these into work for lunch. But don’t want to use the microwave to heat them up. I just want to double check that they are fine to eat cold? Hi. 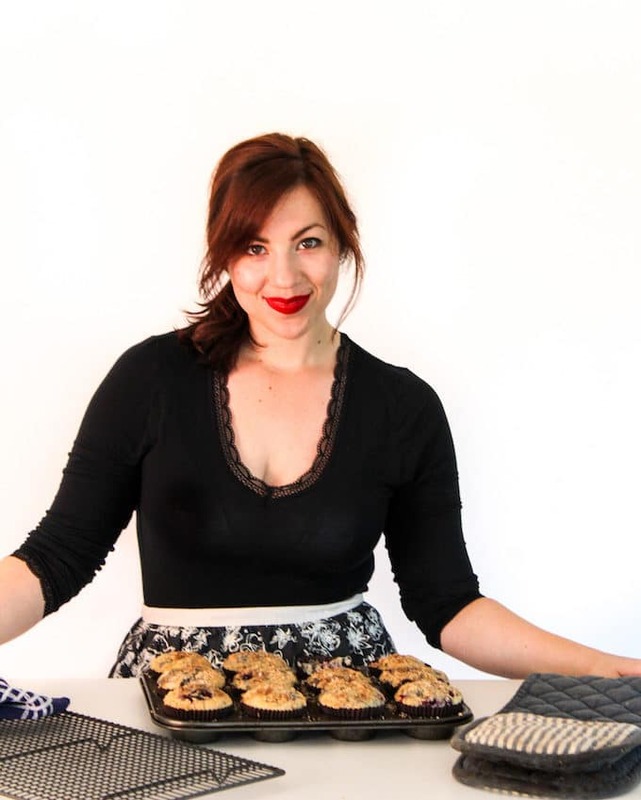 I tried this, I followed the recipe but… I ended up with a mess of crumbly (if delicious) food ! Where did I go wrong?? Please help. Hi Bianca! Glad you still liked the taste even though they crumbled up on you! 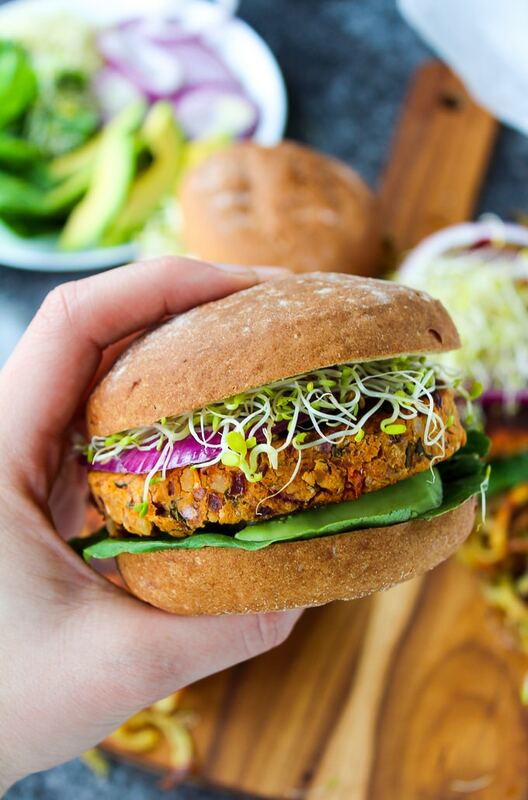 It sounds like there might have been too much moisture in the patties – that’s usually the problem with veggie burgers that fall apart. If you ever wanted to make these again I’d recommend adding more almonds or even adding a couple tablespoons of tapioca or corn starch to create a little more stickiness. That a very gentle cooking should help! Hi. These look delicious and I’m planing on making these for my lunches this week. I was just wondering what you would recommend using for sauce? So glad you liked them! I usually like to make this avocado tahini dip with these (I spread it on everything) https://www.asaucykitchen.com/creamy-basil-avocado-dip/ I also really enjoy this tahini sauce from Minimalist Baker – it’s also soooo good on everything! That should be totally fine! It might affect the taste a tiny bit, but not at all in a bad way! Can I refrigerate or freeze these? If so, for how long? The almonds work kind of like a breadcrumb here that helps with binding. If it were me I would try substituting with breadcrumbs in its place – that being said I haven’t tried it that way so I can’t say with 100% certainty that it would work, but I think it should. Hope that’s helpful! How many burgers does this make? I see it says serves one, is it one pattie? Ahh sorry about that! It actually makes 4 patties – that should be fixed now in the recipe. Thanks for pointing that out to me! Would these turn out if cooked on the BBQ? Hi Ashley, I’ve never tried grilling these so I can’t say for sure. I was able to make these in my cast iron skillet which required a few flips here and there which makes me think that you should be able to. Let me know how it goes if you try it! Yum. I love chickpeas, and these look really good! I might be overlooking it, but I didn’t see the baking temperature. thanks! Hi Maggie! You’re totally right! It’s in there now – bake at 375°/190°C. Thanks for pointing that out to me! i love veggie burgers and seriously have never made a good one. definitely need to test out this recipe! I know what you mean – I’ve made a few before that have turned out a little sad tasting and crumbly. Hope you like this one as much as I do! This looks really good! Are those sprouts on the top in the pictures? I always like to pile on fresh veggies, but never really know what to buy. Yep! I’ve been putting putting them on everything lately – love them! These look amazing! 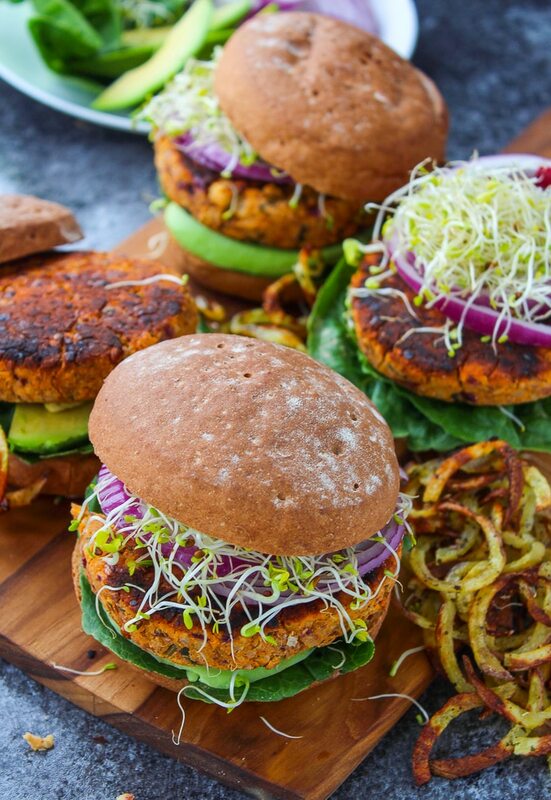 I love a good veggie burger but these would be packed with so much extra flavour! 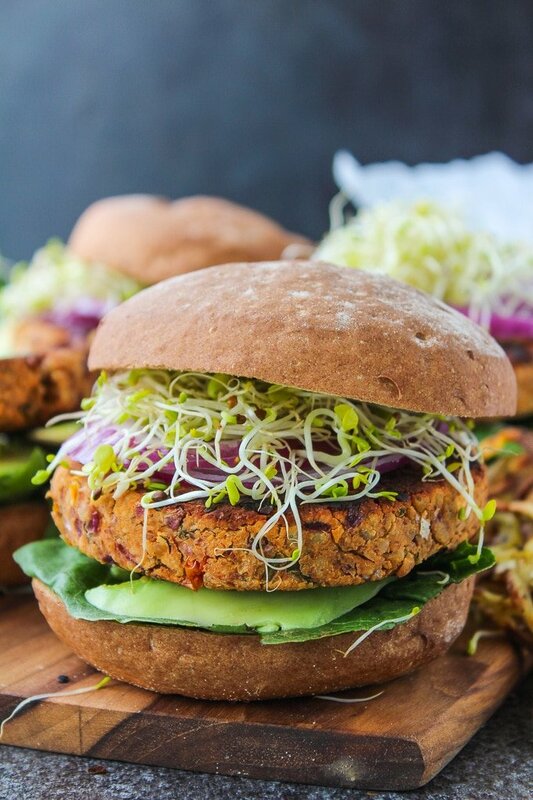 I am sharing a grain free burger today too! And yes, people just don’t get the importance of gluten cross contamination I hate to see gluten free goods sitting with regular goods on serving trays too–come on!! . Great minds! I know what you mean! I see that all the time at cafes and things – drives me mad! These look so hearty and perfect!!! Love that smoky tomato taste!